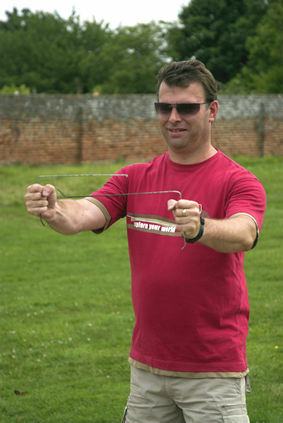 Barry Hillman-Crouch dowsing at Cressing Temple in 2008. Dowsing Days for Archaeological Sites. Ever wondered how dowsing works? I learnt to dowse when I was working as an archaeological site supervisor at Cressing Temple in Essex in 1994. I started out by helping local dowser Colin Peal to record his findings by providing maps and plans and doing the occasional bit of surveying. Gradually my interest increased until I realised that we could prove him right or wrong in his findings when we undertook our Archaeological Field Schools. I wrote my thesis for the Post-grad in Field Archaeology in 1999 and finally published it on the web in 2005. As part of the study I undertook a public dowsing day and 68 participants were taught to dowse with rods. The interest was great enough to repeat the exercise every year usually on the last Sunday in July. In 2006 and 2007 I showed over 100 people how to dowse water mains, cables, buried paths, cellars, ancient buildings and drains. Now I run small Dowsing Day events for local attractions and charities. If you are interested in being amazed at your own innate talents please e-mail me to organise an event at your location. Dowsing is now a recognised archaeological practice and can be used to trace features both before , during and after excavation. It is especially useful for following features out of the sections.